When I crossed the border I have the feeling I was in no man’s land, the distances to cover are long and desolate and along the road there are several signs warning of dangers of unexploded mines. So I inquired about the history of the country, about the shocking history of Cambodian people. I arrived to Cambodia from southern Laos, and as soon as I crossed the border I noticed a change. I knew very little about this country … that it was one of the poorest in Southeast Asia, which had been destroyed due to nearly three decades of war and that it was relatively “new” to the tourism eyes. Cycling along the main road which crosses the north of the country gave me the feeling that I was in no man’s land, the distances to cover are long and desolate, with damaged asphalt due to the heat and rains, and along the road there are several signs warning of dangers of unexploded mines. So during my stay I inquired about the history of the country. The first and up to now the only country that practiced such experience and surprisingly quick. After nearly a century of French colonialism and Japanese occupation in World War II, Cambodia became independent in 1953 and for several years under the command of its king, the economy prospered. But in the late 60’s the country was affected in the Vietnam conflict and the king suffered a coup. In this way the new government sided with the Americans and South Vietnamese who started massive bombing to communist camps in Cambodia. Thus it started a bloody civil war that ended in 1975 with the withdrawal of U.S.A. and taking the capital by the guerrilla organization “Khmer Rouge”. Under the leadership of Pol Pot who was always in favor of complete isolation of the country, a self-sufficient economy and an agrarian state, the Khmer Rouge began one of the most brutal genocides of the twentieth century. That year was declared as the year 0, which indicated the beginning of a process of “purification of Cambodian society”, from capitalism, from Western culture, religion and any foreign influence. So, the currency was abolished, markets and schools were closed and cities were emptied, relocating hundreds of thousands of Cambodians in the countryside. It was the determinant step to the kind of communism that wanted to implement. They carried out the extermination of intellectuals and other “bourgeois enemies” and thousands of people were killed simply because of speaking a foreign language. Others died from malnutrition or disease. Between 1975 and 1979 almost 2 million Cambodians died as a direct result of the policies of the Khmer Rouge. Pol Pot’s government abruptly ended with the invasion of Vietnam, which established the Cambodian People’s Republic with a satellite regime of the occupying forces. Over the next 10 years the Vietnamese army troops remained in Cambodia and the country suffered more fighting. Opposition forces, Cambodians and former members of the Khmer Rouge, were funded by Thailand, China and the U.S. The aim was “to counter the hegemony of Vietnam in the region.” Finally in 1991 were signed peace agreements and two years after elections were held in Cambodia. From the border I cycled to Stung Treng, a small town that lies on the Mekong River. There I stayed at a pension, where his owner charged me in dollars, like most things all over this country. I found it shocking, how local people ask dollars, as if the rail, the national currency does not exist. Even in the most remote places. Then I cycled to Siem Reap, taking the shortest road through the Preah Vihear province and I felt like I was in Africa. The dirt roads are so narrow that seem paths. Due to the lack of bridges any vehicle can travel this route, only motorcycles. So I had to take small boats to cross some rivers. There is not any hotel to stay, neither any place to eat. I was hardly able to buy water and junk food when I was lucky. People are farmer and they have few animals. There is not any basic service. According they explained me the Preah Vihear province is one of the poorest in the country and it is a place in dispute. For years, Cambodia and Thailand are confronted for an area smaller than 5 km ², a jungle-covered hill on which sits a temple dating from the eleventh century. Coincidentally, when I left Cambodia, soldiers from both countries fought using heavy artillery causing casualties on both fronts. Also civilians were dead. “But the real root of conflict between the two countries lies in the dispute over the maritime boundary in the Gulf of Thailand, where there are large oil and gas reserves”. Someone told me. Through a mountain area I kept cycling to the west. The roads are totally destroyed with several parts with sand where I had to push the bike. I didn’t see any fruit tree, just bushes which everybody burn and from where they get wood. At times I’ve crossed some areas completely deforested. One night I stopped in a small village and while I buy water a man comes close to me and in broken English asked me where I go to sleep. Then he invited me to camp in his home. And I don’t doubt it, since many people had warned me to don’t camp alone. Thus, with the nightfall I put the tent while two dozens of people surrounded me. Then I ask for some water to take a bath, so they take me to a pond where other people are taking bath with a bucket. So I also do it, although I am aware that it is the place where also the buffaloes bathe. They invite me to join them. They are relatives and neighbors of the homeowner who are waiting for me next to my tent. They are curious. Although we don’t understand each other we change some words, and I hope that someone offers me something to eat. But it doesn’t happen and I prefer to don’t cook yet. But I am hungry, and after a while I start to do it with all of them around me. “I am the show”. When food is ready I offer them to test it, but they don’t accept. They were very polite; none wanted to share my food. Only when I went into my tent everybody went home. According a friend explained to me since the second century A.D. most of the current Cambodia was benefited from the great trade route between India and China. At that time the territory of Southeast Asia was organized politically in some small tribes and kingdoms. Thus, India was the center of major cultural impact and therefore local people absorbed the religion, language and culture of India. Then between IX and XV centuries, Cambodia was the center of the Khmer empire which was born professing the Hindu religion, but then saw the arrival of a new religion from Sri Lanka, the Theravada Buddhism. 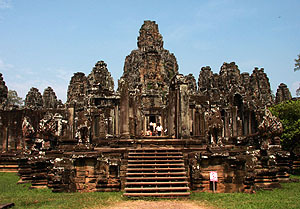 The Khmer empire was the most powerful in the history of Southeast Asia and it extended into the territories of modern-day Vietnam, Thailand, Laos, Malaysia and Myanmar. 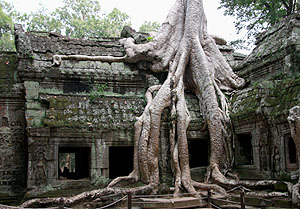 Its capital Angkor had a population of one million inhabitants, majestic temples, palaces and sophisticated irrigation systems that allowed more productive crops. Today the temples of Angkor are the largest religious complex in the world, the main legacy of the Khmer empire and the national pride. During my stay in Siem Reap I also visited the Sap Lake, which is the largest freshwater lake in Southeast Asia. According Samath, a Cambodian friend, during the rainy season the Sap Lake increases spectacularly; its surface can be increased up to 10 times its normal size. This phenomenon results in large profits. People who lives in houseboats on the lake increase the fishing activity due to the lake during the monsoon season becomes one of the world’s richest sources of freshwater fish. At the same time, the flat lands surrounding the lake are flooded and promote the cultivation of rice. Samath told me: “Every Cambodian family usually has a piece of land for cultivation, when the harvest is good on a hectare they can harvest up 1.5 ton of rice, and they can sell it per 0.75 U$S per kilo. Depending on the area of the country a family can have up to 2 or 3 crops a year. Thus, to ensure that a family doesn’t starve they have to store half kilo of rice per person per day until the next harvest”. Finally after a week in Siem Reap where I rested and visited unique places I kept cycling to my next destination: Thailand.